The National Archaeological Museum in Naples is the most important museum in Naples and the whole of southern Italy. 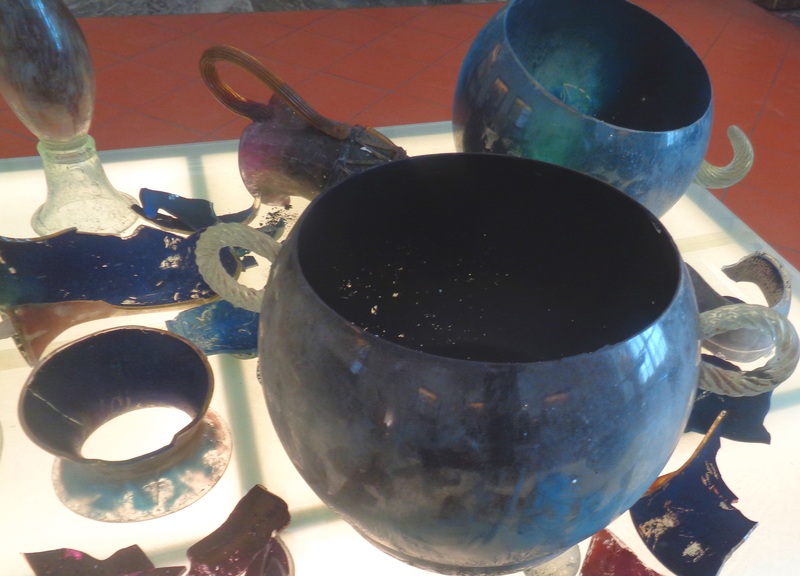 The museum is famous for finds from Pompeii and Herculaneum. These two cities were buried during the eruption of Vesuvius in 79 A.D. and excavated in the last centuries. Almost all the important paintings, sculptures and objects found during the excavation are in the Museum of Archaeology in the centre of Naples. 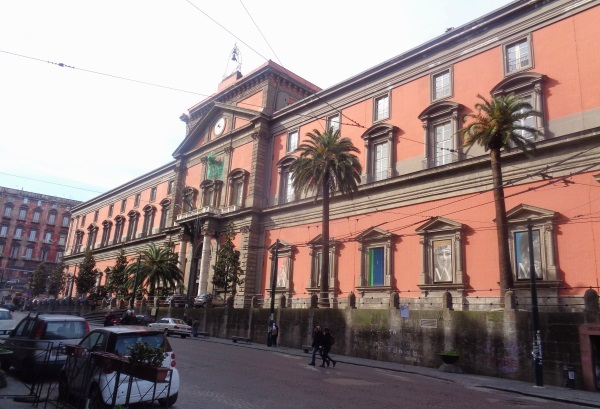 The Museum of Archaeology of Naples has been in existence since 1822, before which the finds from the excavation of Pompeii and especially from the excavation of Herculaneum were in a private collection of the local ruler Charles of Bourbon, King of Naples. The excavations in Herculaneum began earlier (about 1738 in large style, Pompeii a few decades later). Especially in the 18th century many smaller finds were destroyed, the excavations were still little scientific. People were looking for things like gold and valuables like big pictures from antiquity. There was little interest in the smaller archaeological treasures and ancient buildings. On the upper floor of the Naples Archaeological Museum there are objects from Pompeii and other places destroyed by Vesuvius. Below are other exhibits, mainly sculptures. Most of them have nothing to do with the catastrophe of the ancient volcanic eruption. Above all the pictures from the Roman antiquity, which were found in the cities Pompeii and Herculaneum, which were destroyed during the volcanic eruption, impressed us. In the large museum are many such pictures, which are well preserved. Many pictures are frescoes (pictures applied directly to the wall). Mostly from the 1st century B.C. until the eruption of the volcano in 79 A.D. 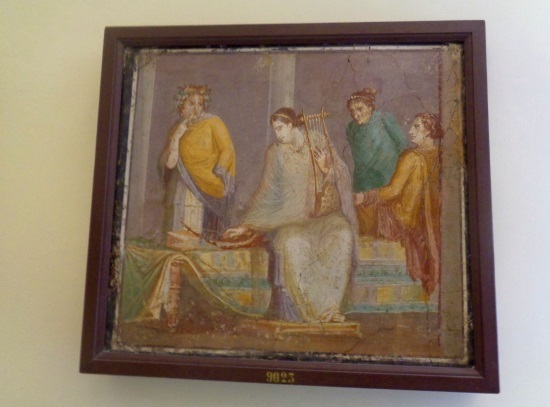 Many murals were covered with a thin, transparent wax layer in antiquity, which is why they are so well preserved. This wax technique has existed in the Roman Empire since the 1st century BC. The pictures have completely different motifs, the people in antiquity were by no means unimaginative. Most of the paintings hung on the walls of private houses. In the Museum of Archaeology in Naples they are arranged according to themes. In a small room of the museum, for example, there are only pictures with animals. In the National Archaeological Museum of Naples there are also other objects from the sunken cities of Pompeii and Herculaneum. 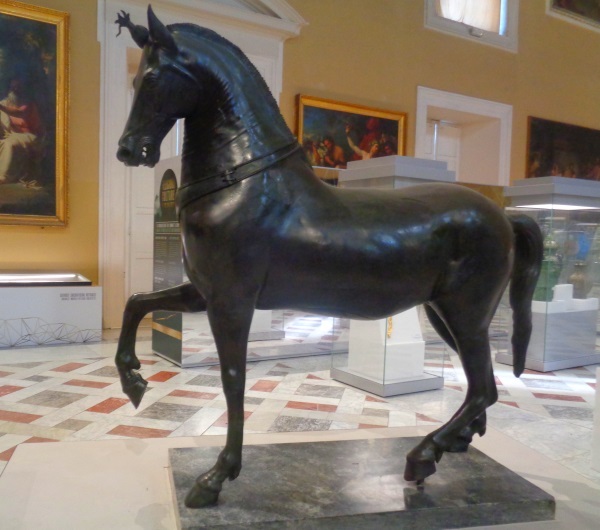 One of the biggest items is a life-size bronze horse from Herculaneum. The museum in Naples also has everyday objects from the cities around Vesuvius that sank in 79 AD. With some things like glasses, pots and pans we had the impression that hardly anything had changed in the last 2,000 years. Shape, colours and patterns are similar today. All children and adolescents under the age of 18 do not pay admission. Otherwise the entrance fees are quite high: Adults pay 15 Euro, there are tickets for reduction for 7,50 Euro. We think that 15 Euro entrance fee is quite a lot. But the treasures of the excavations of Pompeii etc. are also really something special and very interesting. It is worth visiting the archaeological museum of Naples. The museum is open daily except Tuesday. The opening hours are from 9 a.m. to 7:30 p.m. The museum is also open on all public holidays (shorter opening hours on 25.12. and 1.1.). 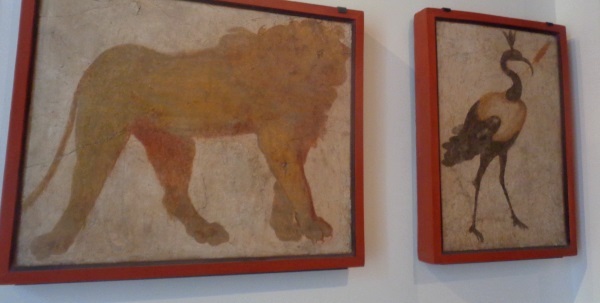 The exhibition, which includes exhibits from Pompeii, is not far from the old town of Naples. Almost all of them come by subway (Metro). It is 5 stations from the main station „Napoli Centrale“ (beginning of 2019 about 1.50 Euro easy) with the metro line 1. The stop is simply called „Museo“. From and to the Old Town you can also walk from the Museum of Archaeology (about 500 meters). It takes about 45 minutes to get to Naples main station.